This tab houses contact and general employment information for the staff member. The majority of the fields are self explanatory, however, there are some fields (Instructor, Type, Position, and Public Nickname) that impact how other areas of Jackrabbit function. A staff member's time clocked in and out of your facility is displayed here. See Staff Clock In / Out for more information on recording staff attendance. A User's access to this tab can be restricted with the Compensation tab User ID permission in the Staff section (Tools > Manage Users & Permissions). It offers an area to enter multiple pay rates. Use the Add Pay Rate button to add each pay rate. Rates can be filtered using the Filter By drop down. See the Staff Compensation / Pay Rates topic for full details. A User's access to this tab can be restricted with the Feedback tab User ID permission in the Staff section (Tools > Manage Users & Permissions). Add a staff member's standard hours and exceptions here. See the Staff Availability topic for more information. Select the image and then the Upload button. Once uploaded, the picture will display. These buttons are used to manually clock a staff member in . out. See the Staff Clock In / Out for a full explanation. The Class Schedule button will open a page where you can use search criteria and display settings to create a schedule for the instructor. The schedule is offered in several formats including export to Excel and PDF. Used to add a manual clock in / out fora date other than the current date. See the Staff Clock In / Out section for more details. 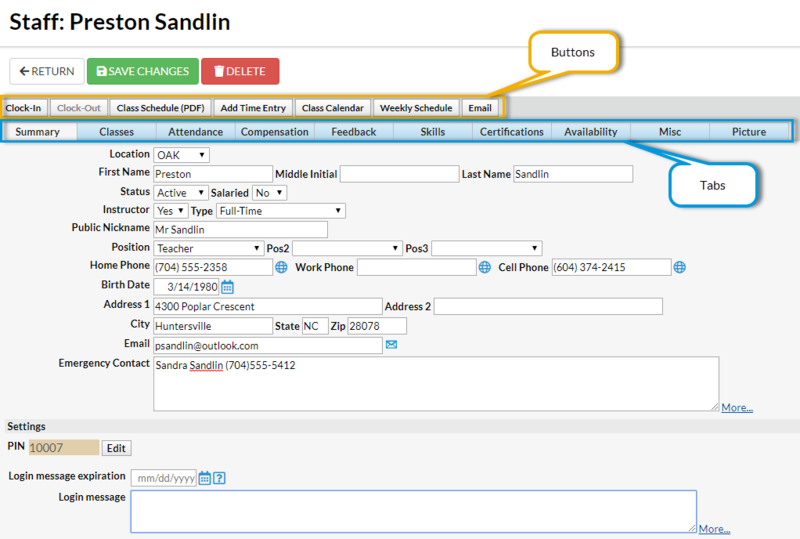 Use the Class Calendar button to display the Instructor's Monthly Calendar. The calendar provides links to the Class records.